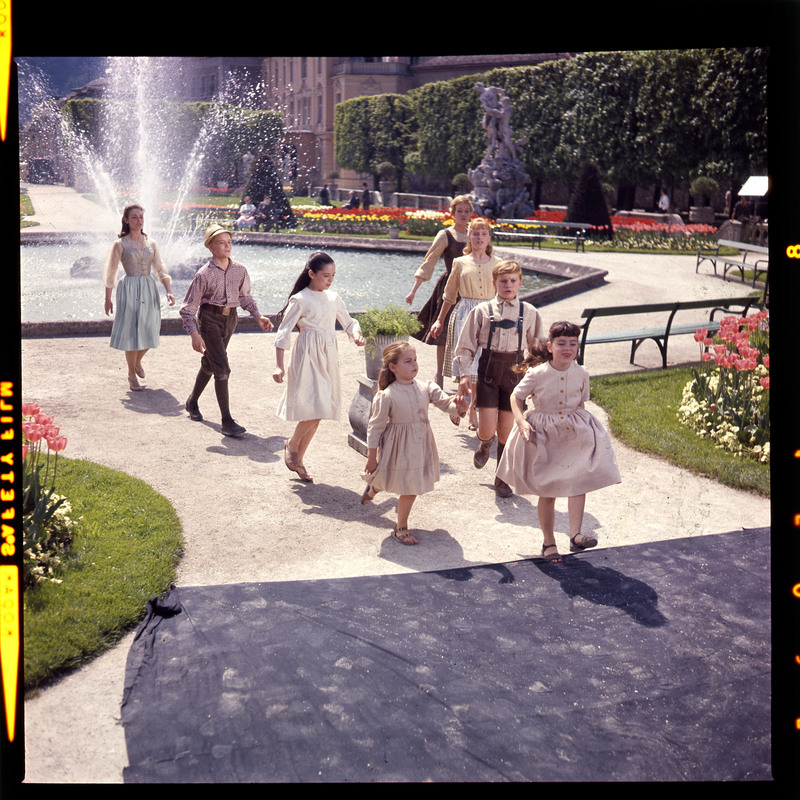 Maria (Julie Andrew, back right) with the children of THE SOUND OF MUSIC. ©20th Century Fox Home Entertainment. The sixth TCM Classic Film Festival gets under way in Hollywood Thursday, March 26. The four-day event, sponsored annually by the popular cable channel, attracts thousands of movie lovers from around to watch movies and hear from legendary movie stars, filmmakers and screen experts. The movies and discussions are held at various theater venues in Hollywood, including the world-famous Chinese Theatre (officially known as the TCL Chinese Theatre). Attendees will be treated to an extensive lineup of classic movies, presentations, panel discussions and special events. The theme for the 2015 TCM Classic Film Festival is History According to Hollywood. Among the highlights of the festival is a special 50th Anniversary opening night gala presentation of “The Sound of Music” (1965) with Julie Andrews and Christopher Plummer in attendance, as well as extended conversations with legendary stars Sophia Loren, who will be interviewed by TCM host Robert Osborne and will participate in a screening of “Marriage Italian Style” (1964), and Dustin Hoffman, who will sit down with Alec Baldwin after a screening of “Lenny” (1974). Also featured, Spike Lee will present a screening of “Malcolm X” (1992); Captain James Lovell will be on hand for the 20th Anniversary world premiere restoration of “Apollo 13” (1995); and legendary entertainer Ann-Margret will appear at a screening of “The Cincinnati Kid” (1973). The festival will pay tribute to Academy Award-winning actress Shirley MacLaine with a pair of screenings and an in-depth interview. The roster is also expanding to include a salute to actor Henry Fonda by his son and two-time Oscar nominee Peter Fonda; appearances by Emmy and Tony Award winner Robert Morse and James Bond actor George Lazenby; and a panel discussion with three people whose real lives and experiences have been depicted on film, including Tony Mendez (“Argo” — 2012), Aron Ralston (“127 Hours”—2010) and Mark Schultz (“Foxcatcher”— 2014). At the opening night gala, “The Sound of Music,” some of the actors who played the Von Trapp children Debbie Turner (Marta), Heather Menzies-Urich (Louisa) Kym Karath (Gretl) and Angela Cartwright (Brigitta) will join Andrews and Plummer onstage prior to the screening at the Chinese Theatre conducted by TCM hosts Robert Osborne and Ben Mankiewicz. TCM will welcome Shirley MacLaine for an extensive celebration of her 60th anniversary as a film actress. The legendary star will be on hand for screenings of two acclaimed and groundbreaking films: Billy Wilder’s “The Apartment” (1960), which earned her an Oscar nomination for Best Actress, and William Wyler’s “The Children’s Hour” (1961), for which she received a Golden Globe nomination for Best Actress in a Motion Picture – Drama. MacLaine will also participate in an in-depth conversation about her storied career in Club TCM, the central gathering point for festival passholders at the Hollywood Roosevelt Hotel. Actor and filmmaker Peter Fonda will mark the 100th anniversary of Henry Fonda’s birth with a special three-part tribute, He will join author and critic Scott Eyman (“John Wayne: The Life and Legend, Print the Legend: The Life and Times of John Ford”) in Club TCM to discuss the senior Fonda’s character, style, career and very unexpected antic humor from the standpoint of a loving son who himself became a symbol for a generation. Fonda will also introduce screenings of two John Ford classics starring Henry Fonda:” Young Mr. Lincoln” (1939) and “My Darling Clementine” (1946). Stage, television and film actor Robert Morse will be at the festival to present a screening of Tony Richardson’s “The Loved One” (1965), the outrageously hilarious satire based of Evelyn Waugh’s novel about Hollywood and the funeral business. Australian actor George Lazenby will introduce a screening of the action-packed thriller “On Her Majesty’s Secret Service” (1969). “127 Hours” (2010); and Mark Schultz, the Olympic wrestler whose entanglements with multimillionaire John du Pont were dramatized in Bennett Miller’s “Foxcatcher” (2014). Mendez, Ralston and Schultz will give firsthand accounts of their “Hollywood” experience working with filmmakers, from the excitement of casting to the surprises of creative license. They will also cover what’s fact and what’s fiction, and how their lives have been impacted by their on-screen portrayals. At a press conference prior to the kickoff of this year’s festivities, TCM Host Ben Mankiewicz, TCM General Manager Jennifer Dorian, Senior Vice President of Programming Charles Tabesh, and Managing Director Genevieve McGillicuddy addressed questions about this year’s schedule of events. Asked what constitutes a “classic,” Tabesh explained there is no cut-off. Most of the films at the festival, however, will be older that 20 years, but the festival organizers show newer films if they deem it appropriate. Additionally, the festival will show films ranging from the musical “1776,” which coincidentally enough, shows the same fountain that is seen in the opening credits of the TV series, “Friends,” as well as a rare 1919 film starring famed magician Harry Houdini called “The Grim Game,” which was recently restored and will have its world premiere during the festival. One of the films the festival wanted to include but couldn’t is the 1961 classic “El Cid,” starring Sophia Loren and Charlton Heston. Movie mogul Harvey Weinstein, who could not be reached by festival organizers, owns the film. Still, there are dozens of films—dramas to comedies, animation to documentary—that will be available for film fans to enjoy during the four-day event. Passes and individual tickets are available at filmfestival.tcm.com.